Again this year for "Nacht der Museen", Frankfurter Allgemeine Zeitung commissioned Station Rose to create the "F.A.Z. Media Lounge". STR set up an audiovisual installation, plus changed parameters live sporadically inside. While last year´s installation for F.A.Z. at Staedel museum stayed more settled in form of a DVD-loop of 20mins, this year´s installation at Kunsthalle Schirn - going for as long as 7 hours (7pm-2am) - included live-performative moments, where Elisa Rose & Gary Danner actively changed/updated their AV-room. 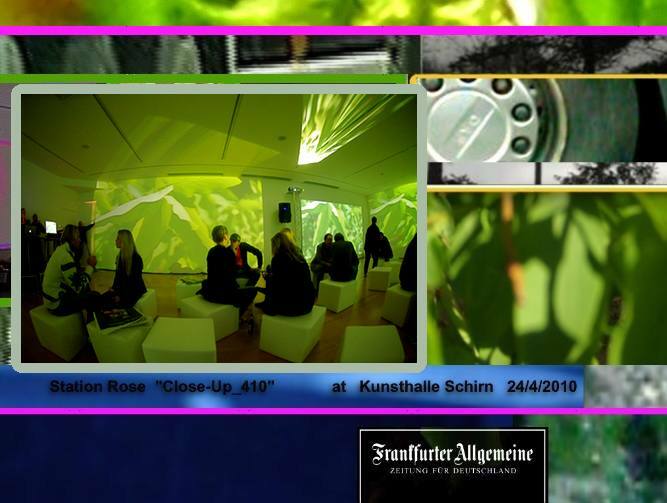 This marathonesque installation (with Sound System & 6 beamers) gave the opportunity to see & hear the artists play & develop their leitmotif <Close-Up_410>. There was no Zeitplan handed out for the performative moments, to keep track and follow the story you had to come back frequently.